BROTHERS IN MUSIC: Seamie O’Dowd (left) and Kieran Quinn have their first album together “Melodic Reflection” which will be launched on February 25 in the Hawk’s Well Theatre. One is a guitarist’s guitarist. One is a band leader. One is a multi-instrumentalist who can play everything from traditional and rock, to blues and jazz. One is a piano player who is equally as versatile. 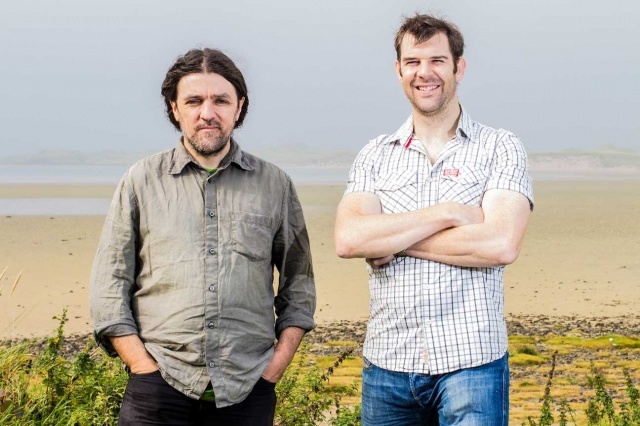 Seamie O’Dowd and Kieran Quinn will both be known to anyone with even a passing interest in the live music scene in Co. Sligo. They have recorded and released solo albums. They have performed as guest musicians on many more recordings. They have appeared on stages large and small, from the Hawk’s Well to a small corner of Connolly’s Pub. And now Kieran and Seamie have recorded an album together. An album which will be launched on Saturday, February 25 at 8pm in the Hawk’s Well Theatre. “Melodic Reflection” contains 13 tracks which showcase a combined sound the duo have honed from two years of performing together in a Monday night residency, first in Furey’s Pub on Bridge Street, and more recently in the aforementioned Connolly’s Bar on Markievicz Road. “We first started talking about doing something together after a night in the Hawk’s Well, it must be about three-and-a-half years ago – around late 2013 – when I launched my first album,” says Kieran Quinn, the former Sligo Senior footballer, who gave up his GAA career to pursue a greater passion – for teaching and playing music. More details on Seamie and Kieran’s album launch night and the return of the much loved Theme Night can be found in this week’s Sligo Weekender- in shops now.